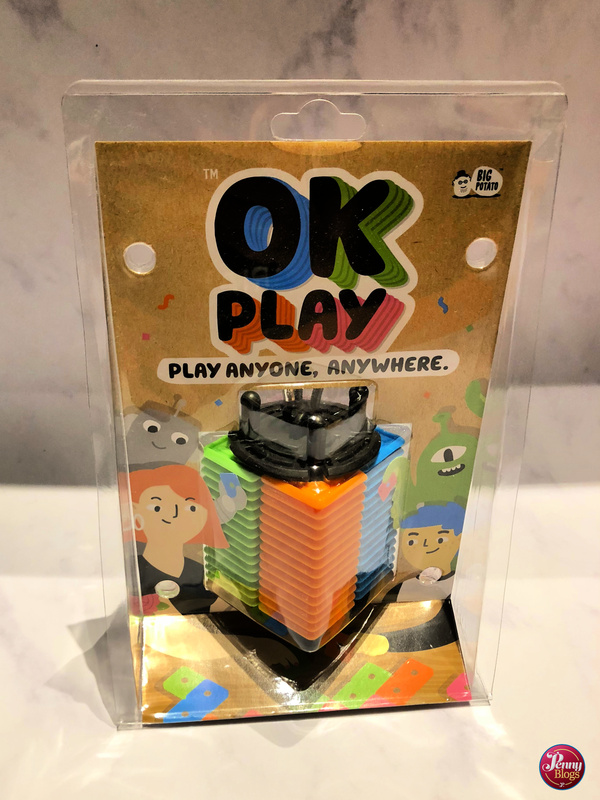 It’s a while since we received a copy of OK Play from Big Potato Games in a Blog On goody bag, but it’s a game that definitely deserves to be featured here on Penny Plays. 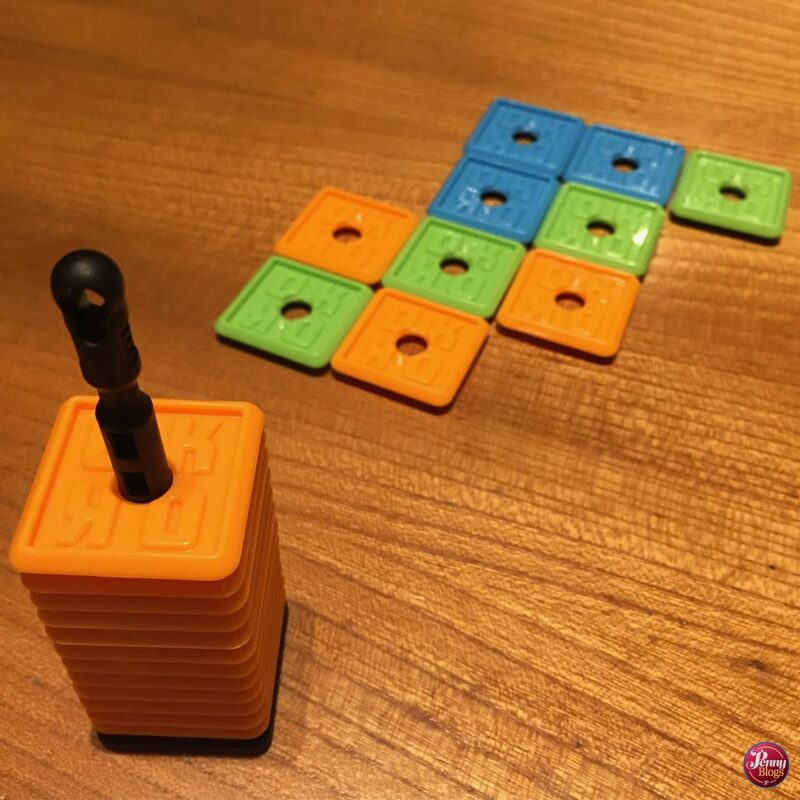 Described as “an off-road Connect 4”, OK Play is a wonderful travel tile game that requires very little to play other than a smart mind. For between 2 and 4 players, the aim of the game is to be able to lay five tiles in a row. Either horizontally, vertically or diagonally. It sounds simple doesn’t it? But it isn’t! Players can then pick up a tile that they have already played and place it somewhere else for their turn. The aim of the game is still the same, but once you’re having to think about both creating your own line of five as well as not opening up another player being able to do so it gets so much more complicated. When we first played OK Play there were just three of us playing. We thoroughly enjoyed the game and made a note to play it again. The second time we played there were four of us round the table and what was immediately obvious was how much it changed the game. When you’re having to think about what three other players are doing it’s much more difficult. At the same time though it does also allow for opportunities where you play something to your advantage and rely on your move forcing another player to block a possible line for another player rather than playing something to their advantage. It’s all about thinking about the order in which people play and very different again to playing with just three players an becomes much more strategic. The unique thing about OK Play is the way in which it is packaged. There is no traditional box. 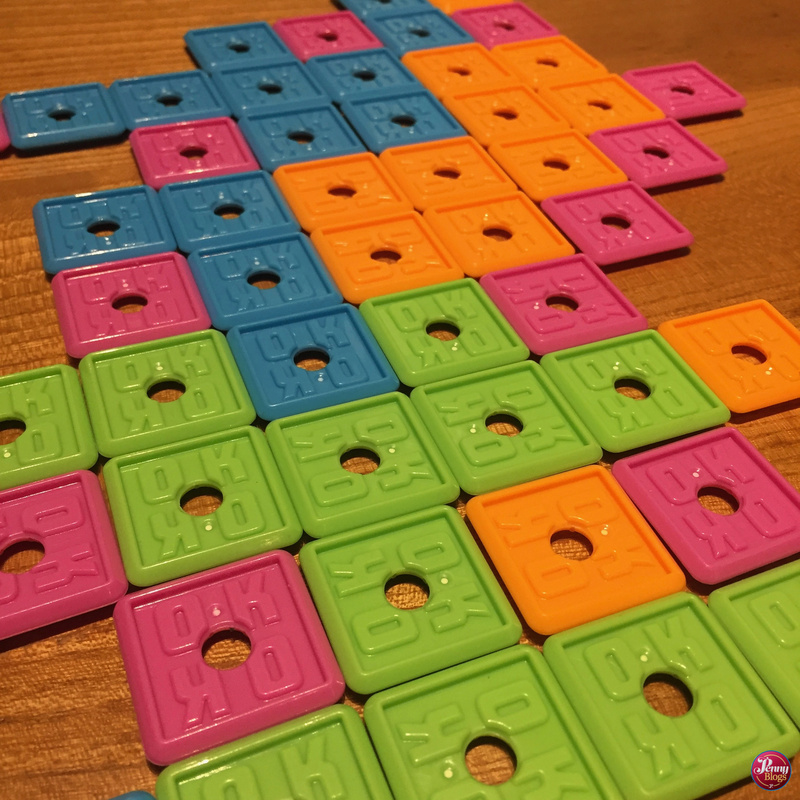 Instead the four different colours of tiles are arranged on 4 plastic rods (each tile having a hole in the middle so they can be pushed onto the rods). The top of each rod connects into a plastic plate which has a carabiner clip on it. This means that OK Play can be clipped onto anything when you’re travelling. Maybe the outside of a rucksack or handbag, or possibly even a hanging hook in a tent somewhere which is what we did over the summer. The only other thing you need to play is a playing surface, but any table will fit the bill for this. Whether it be a camping table or one in a cafe or similar. We absolutely loved OK Play. It’s easy to understand and learn the rules and takes no setting up at all. It’s complicated enough to keep adults and children engaged, and I also loved how portable it is. Ok Play is a game for 2 to 4 players. The recommended age range is 8 to 122. If you’re older than 122 you should contact the Guinness Book of Records immediately according to the packaging! To be honest though – at the other end of the range I think you could start playing at younger than 8, but you might just want to adapt the rules sightly if you do. Disclaimer: We received a copy of OK Play in a goody bag from a Blog On Conference. We were not asked to write this review. All opinions remain my own. This post contains affiliate links.